Research teams led by Tobias J. Kippenberg at EPFL and Michael L. Gorodetsky at the Russian Quantum Center have now built an integrated soliton microcomb operating at a repetition rate of 88 GHz using a chip-scale indium phosphide laser diode and the silicon nitride (Si3N4) microresonator. At only one cubic centimeter in size, the device is the smallest of its kind to date. 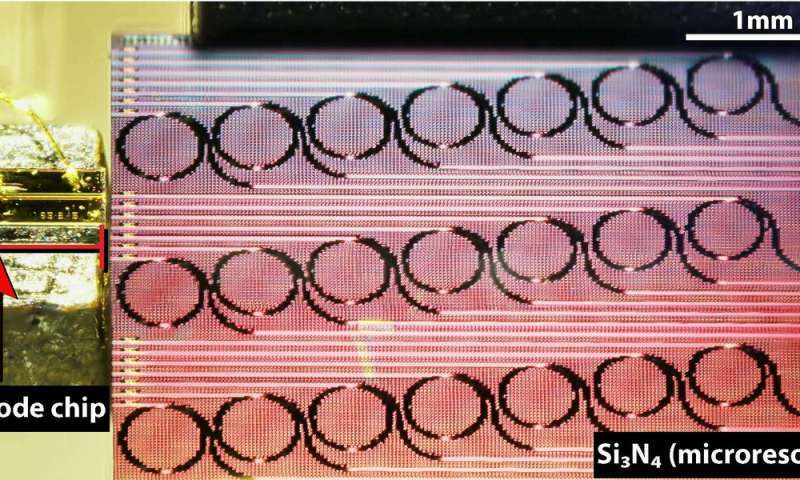 The silicon nitride (Si3N4) microresonator is fabricated using a patented photonic Damascene reflow process that yields unprecedentedly low losses in integrated photonics. These ultra-low-loss waveguides bridge the gap between the chip-based laser diode and the power levels required to excite the dissipative Kerr soliton states, which underlie the generation of optical frequency combs. The whole system can fit in a volume of less than 1cm3 and can be controlled electrically. "The compactness, easy tuning method, low cost and low repetition rate operation make this microcomb system interesting for mass-manufacturable applications," says Ph.D. student Arslan Sajid, the lead author of the study. "Its main advantage is fast optical feedback, which eliminates the need for active electronic or any other on-chip tuning mechanism."